While World Kindness Day is among the events being observed today, for two Cleburne ISD campuses, it’s a daily practice. 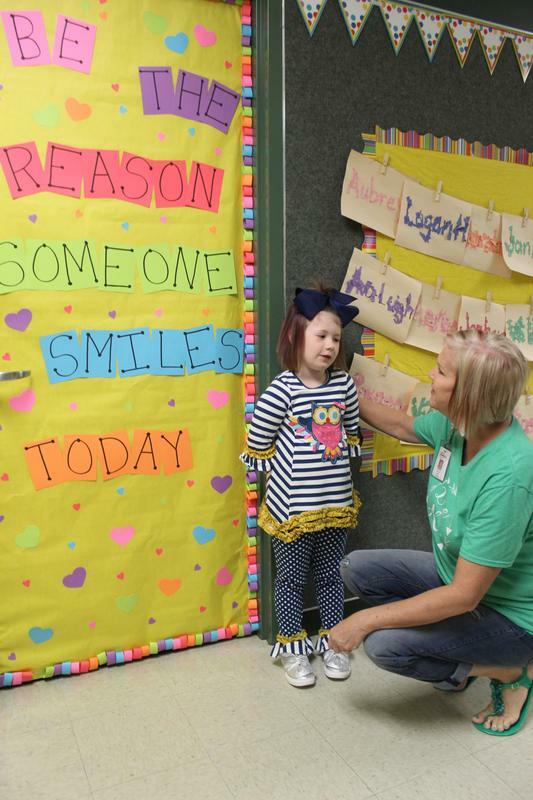 “Color the World with Kindness” is the theme of the 2018-19 school year at Adams Elementary, while at Smith Middle School, members of the newly-formed “Smithonians Promoting Random Acts of Kindness” are impacting their campus climate. At Adams, which several years ago became a “Kindness Certified School” by the Kids for Peace organization, weekly Kindness Challenges to students and staff now go out each week, with a prompt for each day. Signage throughout the campus reinforces the concept. Among the students to embrace the Kindness initiative at Adams is kindergartner Helena Ward. From the start of school, she took the challenges to heart, according to her principal. Hitt said she and her staff are seeing a difference in the way her school’s Gators treat each other. The principal believes the campaign implemented at her elementary campus will hopefully be carried on by her students, as they leave school each day and as they continue on to middle and high school. 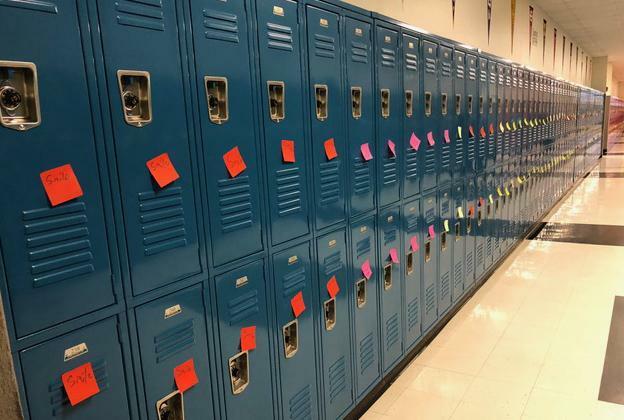 At Smith, the 40 members of Smithonians Performing Random Acts of Kindness have been busy crafting positive notes to be posted on the locker of each of the 800 students at their campus on Tuesday. Organized by Assistant Principal Alanna Lewallen, students had to apply for membership on the S.P.A.R.K. committee. They have been serving as morning greeters for their fellow Jackets, and maintain affirmation stations in the school library, office and cafeteria, where positive notes can be left for students and staff. Sixth-grader Brenna Hollingsworth is among the S.P.A.R.K. members at Smith. Eighth-grade S.P.A.R.K. member Journey Harris says she began her own kindness campaign when she came to Smith in the sixth grade. Harris said she always heads for class in a great mood after greeting classmates at the start of the school day. Hollingsworth agrees the S.P.A.R.K. effort isn’t limited to her classmates or her campus. Adams Elementary Principal Dawn Hitt visits with kindergartner Helena Ward about the kindness theme adopted at the campus this year. 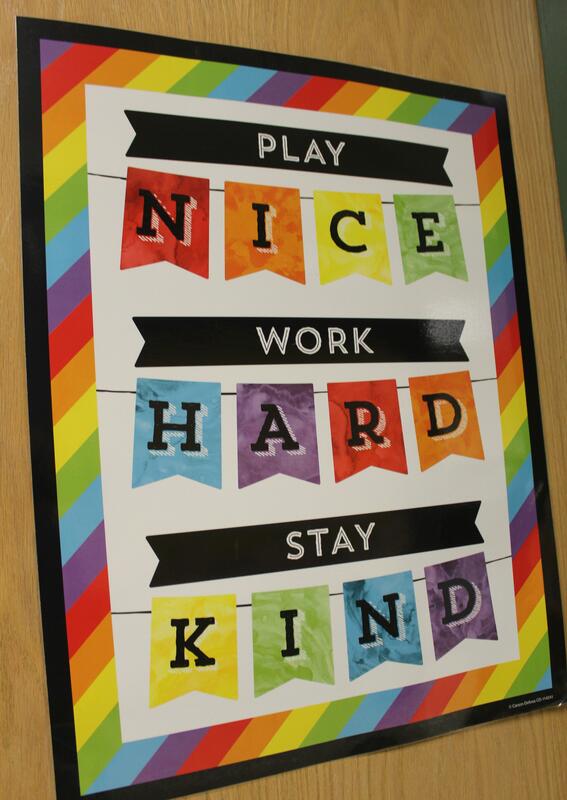 Students and staff are issued weekly kindness challenges, with a goal for each school day. Smith Middle School S.P.A.R.K. 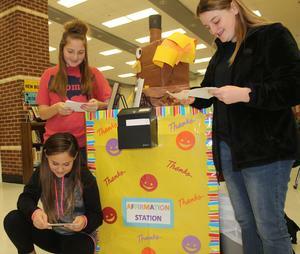 members l-r, Brenna Hollingsworth, Journey Harris and Marnie Williams look through the notes of kindness left in the library Affirmation Station. The 40-member Smithonians Performing Random Acts of Kindness is a new student organization at the campus. Notes were posted on all the lockers at Smith Middle School overnight, with positive messages for each student, in celebration of World Kindness Day. The messages were written by members of S.P.A.R.K. a new campus student organization focused on providing random acts of kindness.